For this post we are going to have some fun with falls favorite gluten free candy! 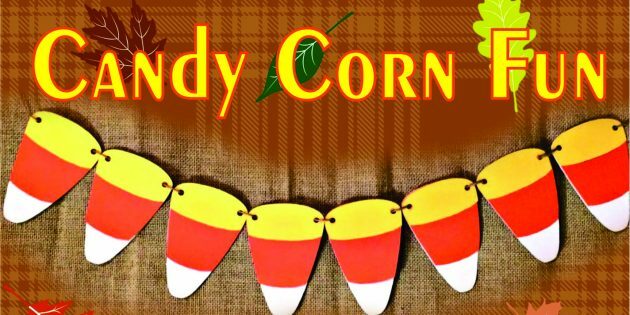 Below are several ways to incorporate candy corn into gluten free recipes! Be sure to have the little ones help you with these! If you are just popping in today make sure to go check out Volume 1 and 2 that we posted earlier this week!! Happy Haunting!! Place a large piece of parchment paper or wax paper on the counter. In a giant bowl or large stock pot pour the popcorn and candy corn. Mix with your hands or a spoon and set aside. Place the butter in a large, non-stick saucepan over medium heat and melt butter. Once melted add the marshmallows and cook, stirring until melted and smooth. Pour the melted marshmallow mixture over the popcorn mixture and toss to coat. Now for the fun part. Spray your hands with non-stick spray and shape the popcorn into balls. Squeezing very tightly so that it will stay together. Set popcorn balls on parchment paper as you finish each one. You will need to coat your hands after each one as this mixture is very sticky. Let cool for at least 10 minutes or until the popcorn balls are firm. Place on a serving platter or bowl and serve. Dutch ovens are my favorite. It worked perfectly for the recipe above and the marshmallow didn’t really stick to it. If I had to only keep one pot in my kitchen this would be it! They tend to run a little on the expensive side of things but its completely worth the price for a good one and it will last you a life time! 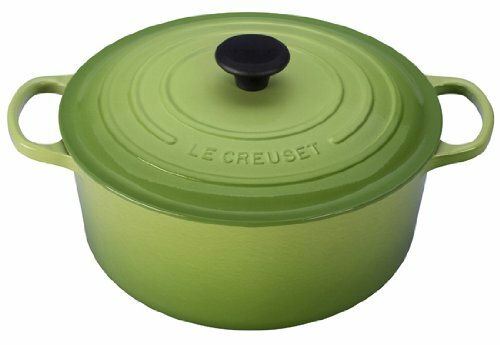 I have the Le Creuset Dutch Oven and would suggest it to anyone! Click on the link to check it out!!! For the same saucepan I used in this recipe click on the link. Its the All-Clad 4 Quart Saucepan. 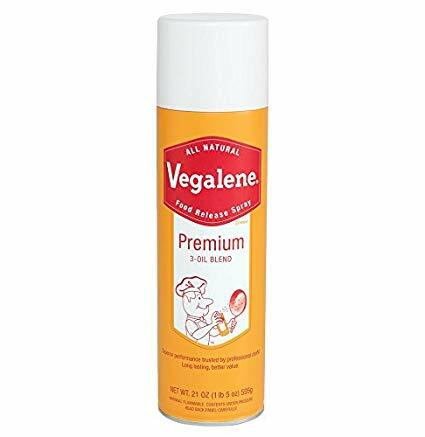 It is a little on the expensive side but completely worth it if you enjoy cooking as much as I do. In the past I used to buy cheaper pots and pans but over time I’ve had to throw them out because either they warp or the non stick coating comes off among other things. 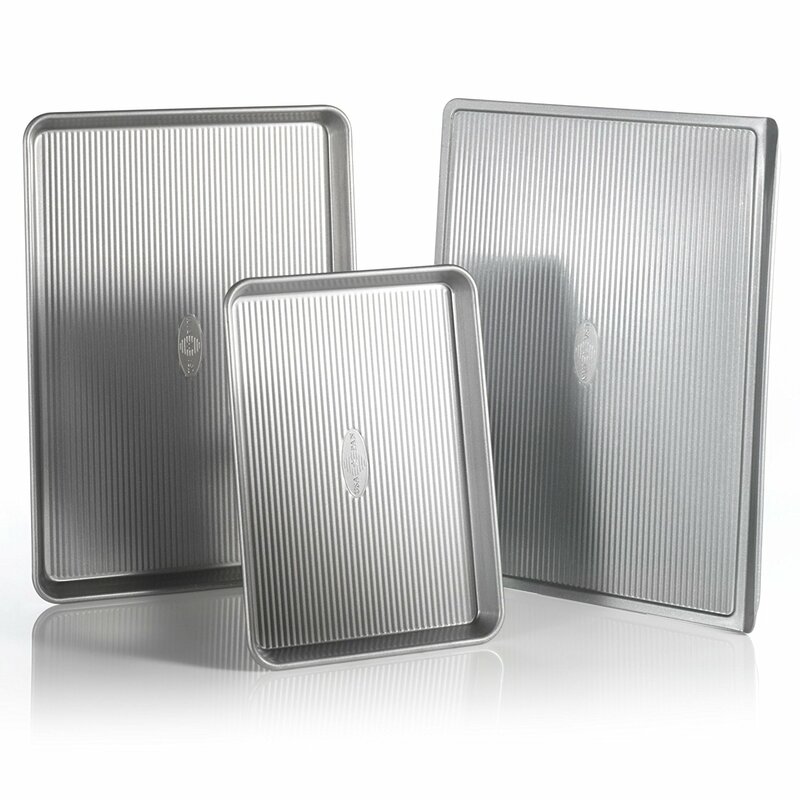 I have had great success with the All-Clad cookware a definitely recommend you trying them!! Prepare a baking sheet with either parchment or wax paper. Pop popcorn and remove any leftover un-popped kernels. Lay out popped popcorn on prepared baking sheet in a single layer. In separate microwave safe bowls heat up the white, orange, and yellow candy melts according to package directions. Pour melted candy melts into individual sandwich baggies or pipping bags. Cut the tip of the bag open with scissors just enough to allow the candy melts to flow freely. Starting with the white candy melt, drizzle over the top of popcorn this will allow the candies to stick to the popcorn. 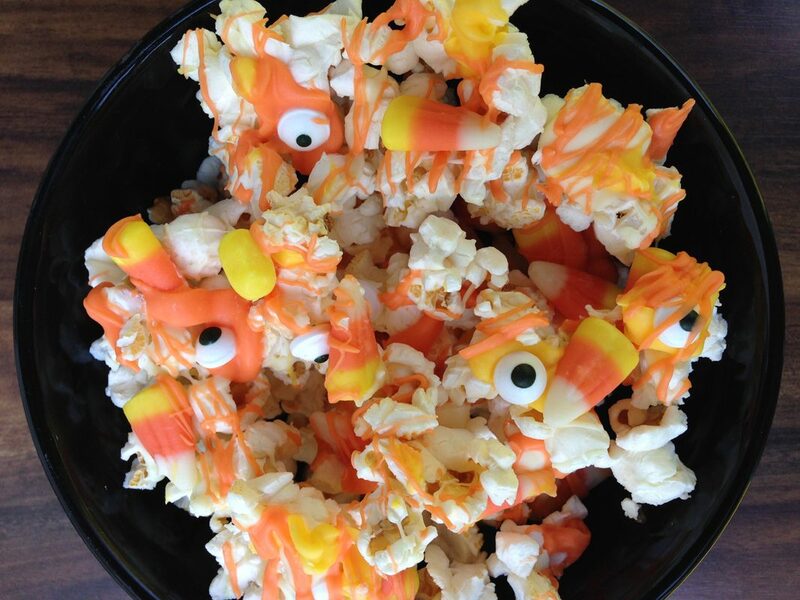 Then add the candy corn and candy eyeballs to the top of the popcorn adding as few or as much as you wish. 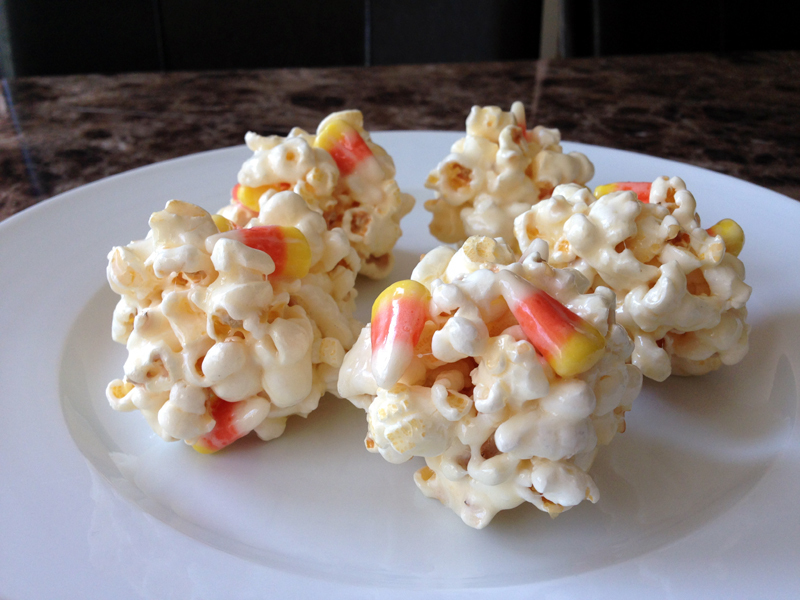 Take the other two candy melts and drizzle over the top of popcorn to finish it off (you can add more candy eyeballs or candy corn if you wish). Let cool for at least 15 minutes or until the candy melts have hardened. Break or cut apart into chunks and enjoy!! For this recipe we are going to start out with baking some cupcakes. Take the King Arthur Chocolate Gluten Free Cake mix and bake as per the box instructions (be sure to use cupcake cups it makes clean up a lot easier). Once the cupcakes are completely cool frost them with the chocolate frosting. They don’t have to be perfect I think they look more like monsters with the frosting a little messy. 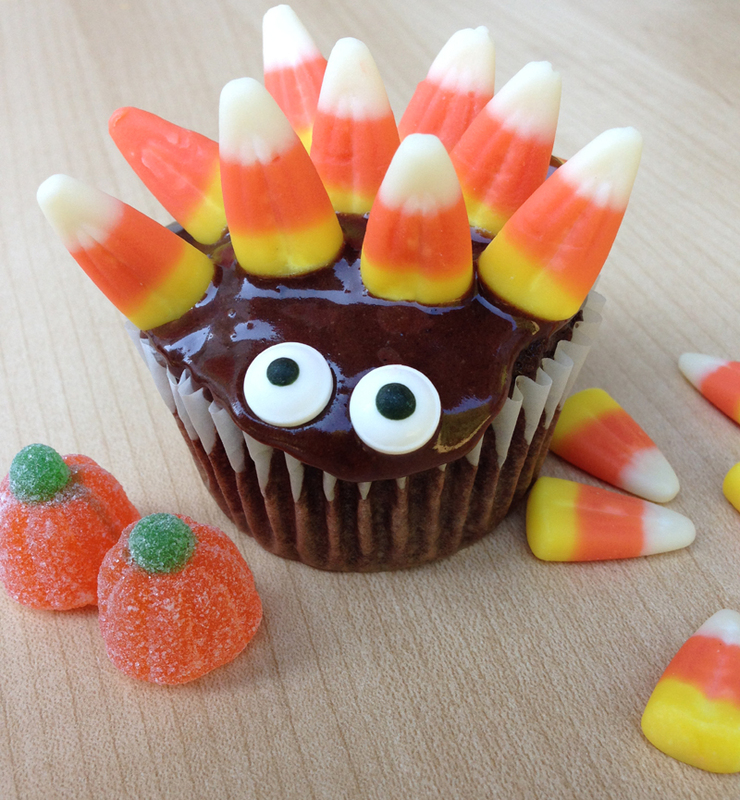 When you have all of them frosted, take your candy corn candies and place them into the cupcake standing up so they look like spikes coming out, leaving a spot for the candy eyes. 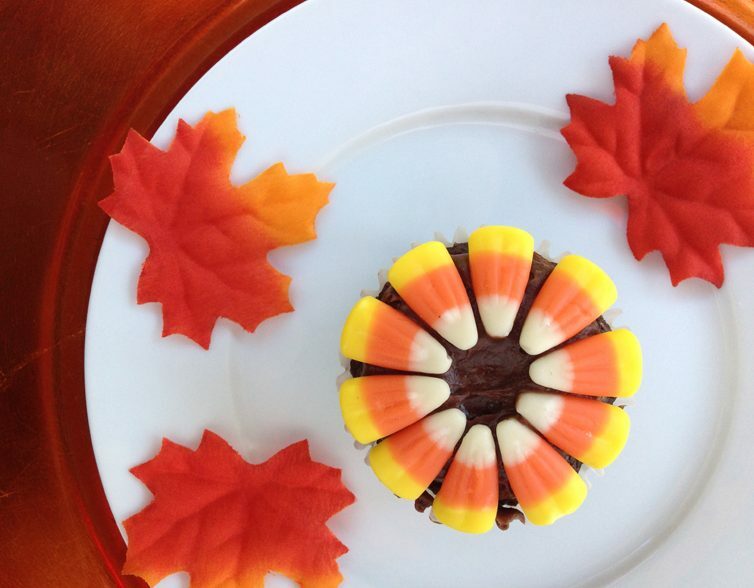 Lastly place your candy eyes in open spot and place on a serving platter or cupcake stand. I have tired almost every gluten free cake mix out there and a few years ago when I was about to give up I found the King Arthur Chocolate Cake Mix. Finally one that was good!! Even my non gluten free family members couldn’t tell the difference and loved this cake mix. If you haven’t tried it yet you are missing out!! Click on the link to give it a try you will be glad you did!! We are going to start out with baking some cupcakes. 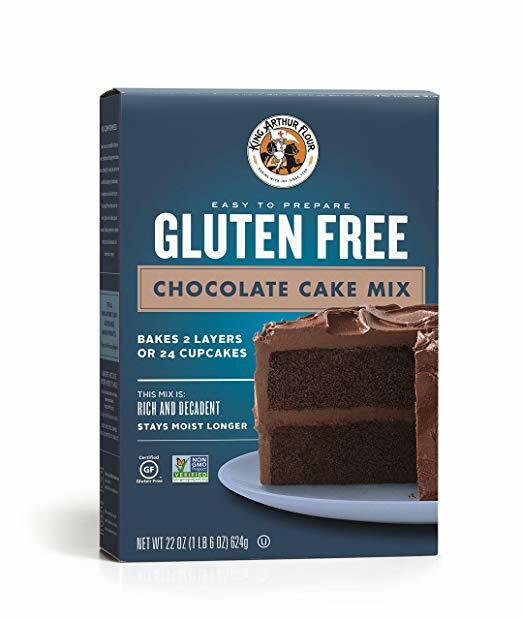 Take the King Arthur Chocolate Gluten Free Cake mix and bake as per the box instructions (be sure to use cupcake cups it makes clean up a lot easier). Once the cupcakes are completely cool frost them with the chocolate frosting. Once you have frosted all of the cupcakes, take your candy corn candies and lay them onto the top of the cupcake, yellow part towards the outside of the cupcake so they will look like flower pedals. Leave a small space on the inside so it creates the center of the flower. Continue laying them around the cupcake until it is covered all the way around should be about 10 candy corns per cupcake. Repeat last step until all the cupcakes are covered. 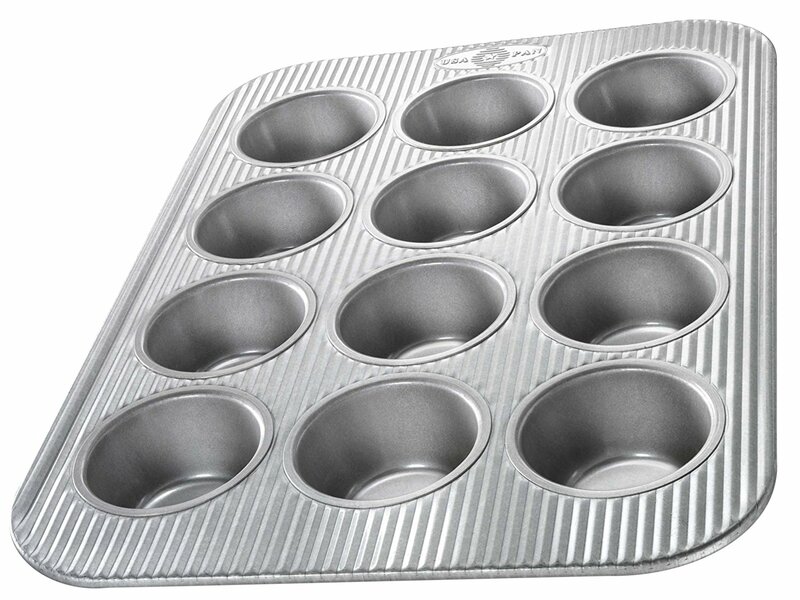 When all cupcakes are covered place on a serving platter or cupcake stand and serve. Make sure to have the kiddos help you with this recipe! Take a gluten free pretzel stick, I used the Glutino Gluten Free Pretzel Sticks, and break it in half. Insert the pretzel stick halves into the cookie filling to create legs. 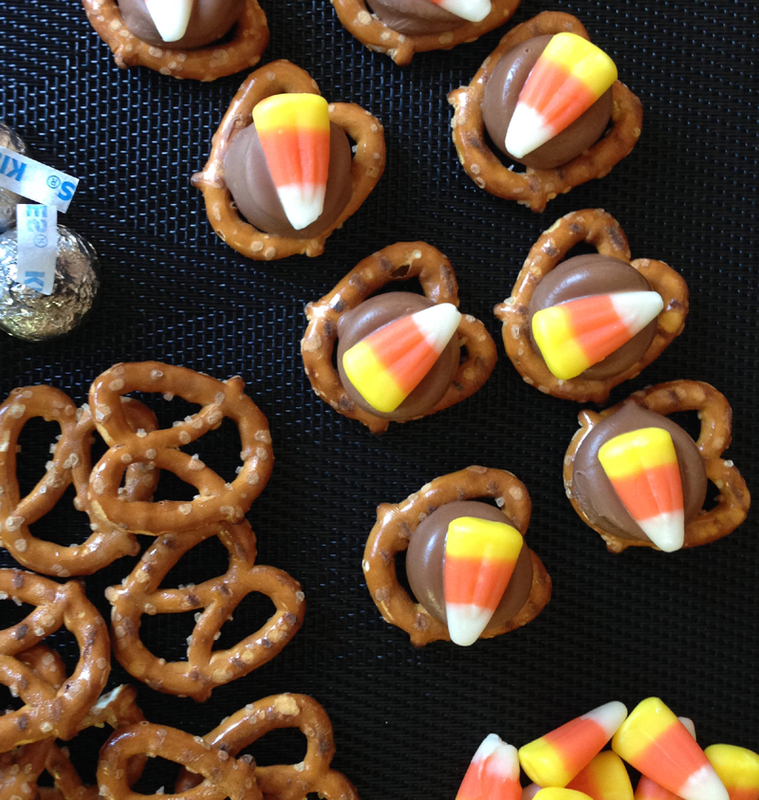 Take about 5 or 6 candy corn candies and stick them into the cookie filling opposite side of the pretzel stick legs to make the feathers. Finally take a candy corn and two googly candy eyes and place a small dot of royal icing on the back. 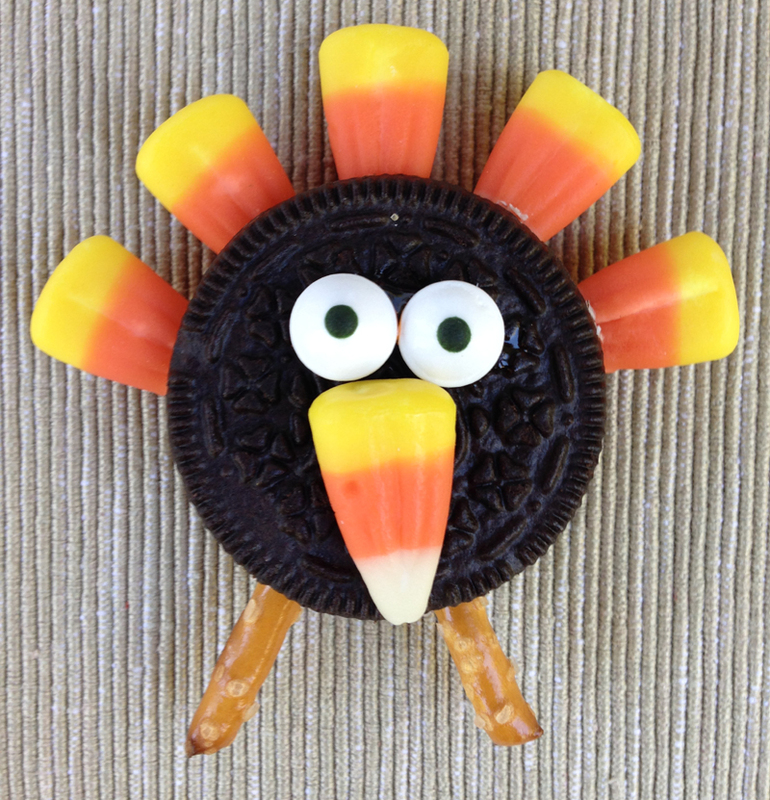 Place your candy eyes and candy corn nose onto the face of the cookie to create the face of the turkey. Repeat steps to create as many turkeys as desired, place on a serving platter and enjoy!! 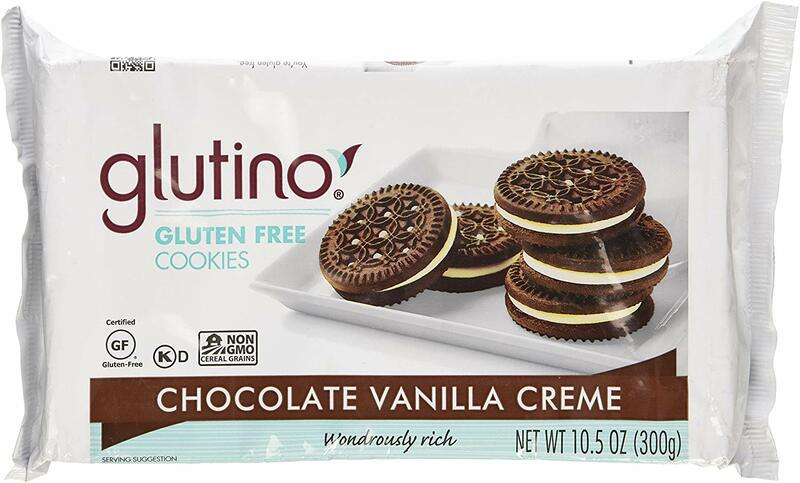 For the chocolate cookie in this recipe I used the Glutino Gluten Free Cookie. These cookies are fantastic and taste just like the real thing. When I was diagnosed with celiac disease I thought I would never be able to enjoy a oreo with milk again but luckily I found these at a convention a couple years ago. If you haven’t tried them then click on the link and give them a shot!! The Pretzels I used for this recipe are really good! I used the Glutino Pretzel Sticks. They are gluten free certified and the perfect snack! 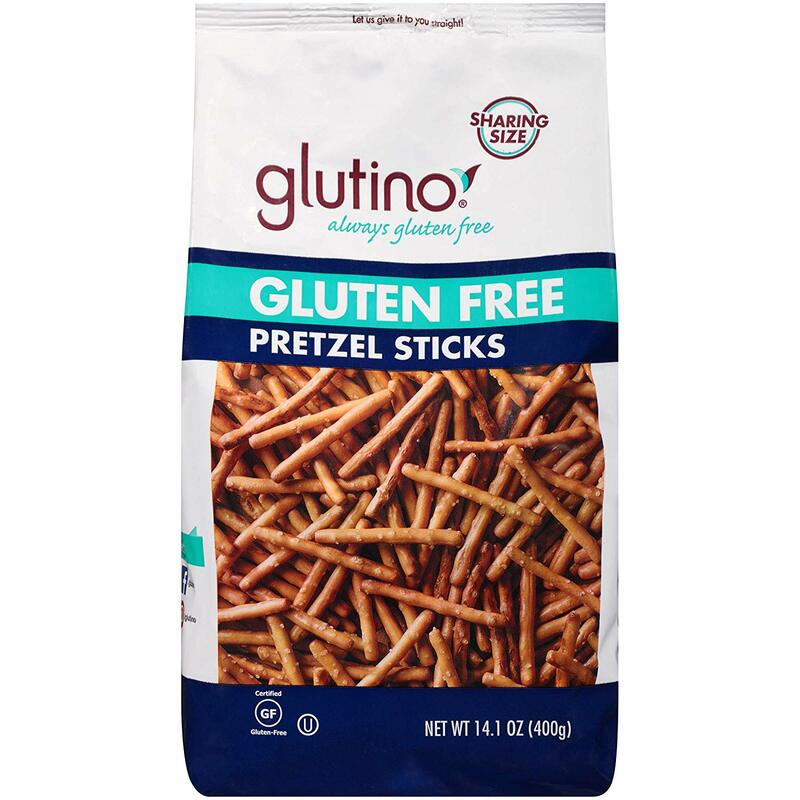 Glutino has a wide variety of gluten free snacks and the pretzel sticks worked perfectly for the legs in this recipe. Click on the link to give them a try!! Preheat the oven to 250 and prepare a baking sheet with parchment paper or a Silpat mat. Unwrap chocolate kisses and set aside (you will need one per pretzel twist). Place as many pretzel twists on the baking sheet as you desire and lay a chocolate kiss on each one. Place baking sheet in the oven and bake until the chocolate just begins to melt, about 4 minutes. Make sure to watch them. You don’t want the chocolate to melt all the way. Immediately remove them out of the oven and press a candy corn right on top. Let stand to cool or pop in the fridge to allow the chocolate to set up faster (about 10 minutes). Once cooled remove from fridge and place on a serving platter and enjoy!! The Pretzels I used for this recipe are really good! I used the Glutino Pretzel Twists. They are gluten free certified and the perfect snack! 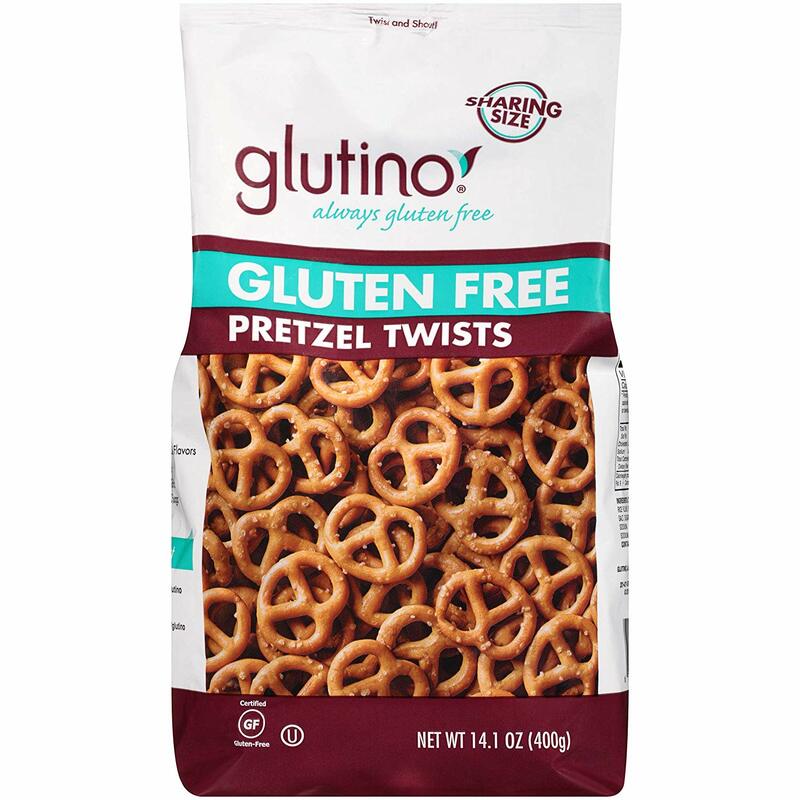 Glutino has a wide variety of gluten free snacks and the pretzel twists worked perfectly for the base in this recipe. Click on the link to give them a try! !